I have been an artist for more than thirty years working professionally in the field of public art installations. I have many large tapestries, fiber hangings, and ceramic tile murals in state office buildings, schools, and other facilities in Alaska and California. I retired from public art six years ago, and returned to an old love, oil painting. I have been concentrating on Plein Air painting and studio still life paintings. Since moving to the Klickitat Valley, I am enjoying the dynamic landscape around the Columbia River, and am trying to capture its dramatic moods, open skies, and changing colors. The past few years I have been painting a series of Women Archetypes. They are taken from mythology, and from contemporary and historical concepts of women. I consider them as stereotypes, not deep insights, so they are not psychological portraits. The complexity of personality is often overlooked on first impression. A woman may be described as an Earth Mother”, a “Nature’s Child”, or more generalized terms, without looking beyond the initial impression of that woman. I prefer a more positive imagery. 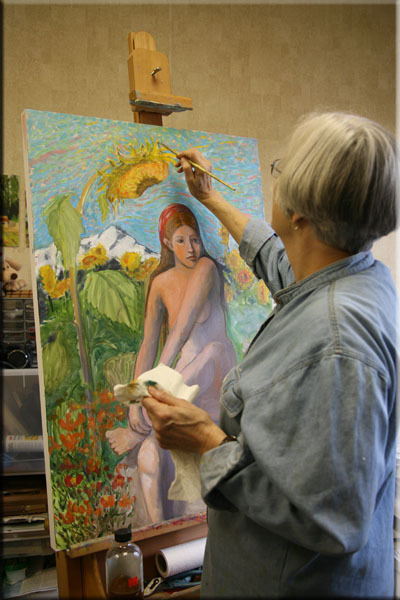 The essence of the women I paint is a reflection of 'The Feminine' idealism. I have a deep love for the natural world and spend much time watching, especially birds, landscapes, and weather phenomena. It is reflected in much of my work. Lately, I have returned to some early illustration work of birds, and I am using block printing and monotypes to express my delight in these and other creatures. I hope you enjoy looking at my website, and thank you for stopping by.